The latest episode in the X-Men series arrives with rave reviews. 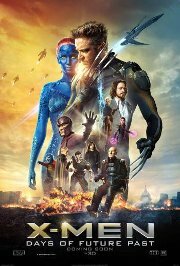 Based around a time-travelling tale, the ultimate X-Men ensemble fights a war for the survival of the species across two time periods. The characters from the original trilogy join forces with their younger selves from the past (as seen in First Class), in order to change a major historical event and fight in an epic battle that could save our future. This film is releasing in 2D and 3D, this is the 3D version. Comments The plot is complex and may be upsetting to younger children.